and Turkey (Kusadasi / Ancient Ephesus). 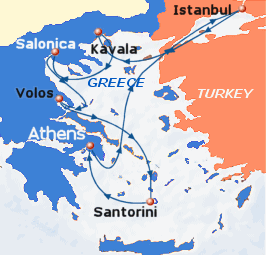 Most of them are circular cruises departing from Piraeus; embarkation/disembarkation is, however, possible at other ports of call along the cruise itinerary. The Celestyal Cruises fleet consists of medium sized cruise ships of less than 500 cabins each (except from the ‘Celestyal Olympia’ which has 725 cabins), offering a more intimate ambiance and personalized service. The 3-, 4- & 7-day programs combine the brilliant Aegean Sea, studded with the stunningly beautiful Greek islands, with historical gems like the breathtaking Parthenon in Athens and the grandiose ancient city of Ephesus, unique samples of world-defining civilizations. 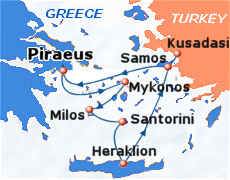 Round trip cruise from Piraeus (Athens), Greece. Departs on Friday at 11:30 and returns on Monday at 07:00. Year 2019: March, April, May, June, July, August, September, October, November. Year 2020: March, April, May, June, July, August, September, October, November. Ports of call: Piraeus (Athens), Greece / Mykonos, Greece / Kusadasi (Ephesus), Turkey / Patmos, Greece / Crete (Heraklion), Greece / Santorini, Greece. Departs on Monday at 11:30 and returns on Friday at 07:00. Ports of call: Piraeus (Athens), Greece / Mykonos, Greece / Kusadasi (Ephesus), Turkey / Patmos, Greece / Rhodes, Greece / Crete (Heraklion), Greece / Santorini, Greece. Spend a week on-board the comfortable “Celestyal Olympia” cruise ship, visiting five of the most famous Greek islands, including a full day on the island of the Knights, Rhodes. Departs on Monday at 21:00 and returns on Monday at 09:00. Year 2019: April, May, June, July, August, September, October. Year 2020: May, June, July, August. Ports of call: Piraeus (Athens), Greece / / Mykonos, Greece / Milos (Melos), Greece / Santorini (Thira), Greece / Crete (Heraklion), Greece / Kusadasi (Ephesus), Turkey. A week-long cruise to famous Greek islands and one port in Turkey, all being top summer destinations in the Aegean. Highlights: overnights in Mykonos and Santorini! Year 2020: February, March, October, November, December. 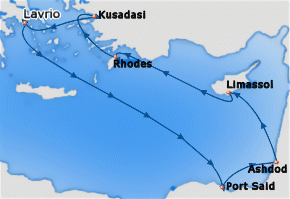 Ports of call: Piraeus (Athens), Greece / Alexandria, Egypt / Port Said, Egypt / Ashdod, Israel / Limassol, Cyprus / Rhodes, Greece / Kusadasi (Ephesus), Turkey. The cruise is rightfully called 3 Continent as it includes ports of call in Europe, Asia and Africa in just 7 days: archaeology, religion and culture, this cruise has it all! Departs on Monday at 16:00 and returns on Monday at 09:00. Year 2020: April, May, September, October. Ports of call: Piraeus (Athens), Greece / / Istanbul, Turkey / Canakkale, Turkey / Volos, Greece / Heraklion (Crete), Greece / Santorini (Thira), Greece / Mykonos, Greece. This cruise combines some all time classic destinations with some new, fascinating ones in a balanced and well-paced itinerary. It offers long stays at most ports of call, thus allowing time for exploration without stress.